Shell has a long history of undermining protest. The company applies an interesting mix of PR strategies, denials and greenwash exercises on the one hand and the dirty tricks and undercover operations on the other. For Shell, or so it seems, cooperation with a military government and police Special Forces in an African country is just one step beyond involvement in private intelligence agencies and cybersurveillance in Europe and the US. It’s all part of the game. 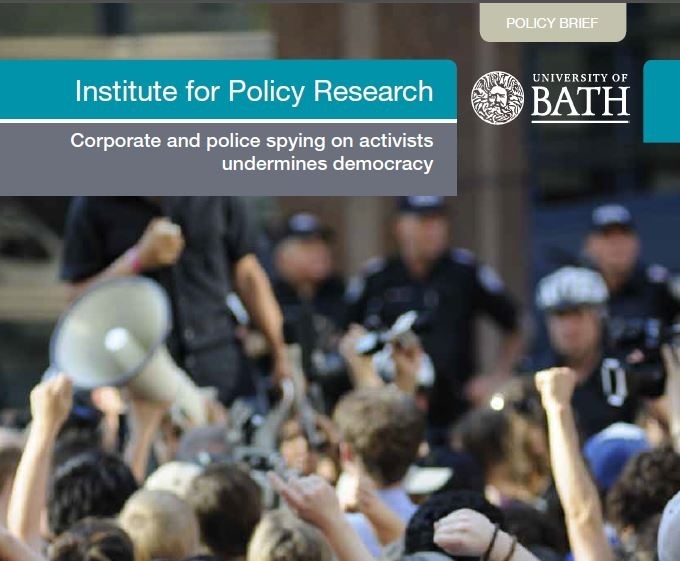 However, investigating corporate and police spying on activists also brings up the question what can be done about it. The Kiobel case might be key in answering that question. Shell features in most – if not all – chapters of Secret Manoeuvres. In the 1980s, the company hired Rafael Pagan to develop a strategy plan designed to neutralize boycott groups campaigning against Shell’s continuing involvement with the apartheid regime in South Africa. The strategy, detailed in Chapter 3, is still being used today. Dialogue with major constituencies, such as moderate church groups, was of major importance. Each contact with the company’s opponents was essentially an information-gathering opportunity too. The strategy was intended to divide and conquer campaigning coalitions. Chapter 5 details how Shell was one of the first to monitor the online presence of campaigners. The company was one of the first to appoint an internet manager, after it was taken by surprise by the force of online campaigns against the sinking of the Brent Spar and against the execution of Ken Saro-Wiwa and eight others defending the rights of local communities in Nigeria. Around the same time, in the mid-1990s, the oil company was involved in setting up a private intelligence agency for the same reason. Chapter 6 explains how former staff of MI6 hired a freelance spy posing as an activist film maker to interview campaigners all around Europe about their future plans in regards to oil companies. The gathered information was used pro-actively, to undermine the surprise factor of for instance the publication of new research or Greenpeace’s occupation of an oil rig. In 2009, the case to hold Shell responsible for involvement in the execution of Ken Saro-Wiwa in Nigeria was settled out of court in New York. For $ 15.5m the company tried to buy silence, but not for long – as the Kiobel case shows today. The evidence collected in the years leading to the settlement threatened to be shelved. Andy Rowell and I found some funding and started going through the material. We discoverd that in Shell’s response to the crisis in Nigeria and the killing of Saro-Wiwa, public relations were more important than human rights. In the wake of the 15th anniversary of the executions, The Guardian published our article on Shell’s greenwash operation. We also found evidence of Shell paying Nigerian Special Forces dealing with protesting local communities. The Independent captured our findings: ‘New evidence suggests that Saro-Wiwa was framed.’ Argos, the investigating reporters’ radio show on the Dutch national radio devoted two programs to our research, the second one the week Shell was grilled in Dutch Parliament over environmental issues and human rights in Nigeria. London Platform went to Nigeria to collect more stories of local people today to develop the evidence of oil companies’ close ties with the military and the police. This resulted in Counting the Cost. Corporations and human rights abuses in the Niger delta (October 2011). Relatives of some of the Nigerians executed with Saro-Wiwa filed a seperate case in the US. Esther Kiobel c.s. are now before the Supreme Court in Washington D.C. And, as said, it is not just about Shell in Nigeria anymore (as if that would not be enough). Other multinational companies feel the heat as well. Many, like Coca Cola, Chevron, BP and GE have filed a so- called Amicus Curiae Brief to make their case. They fear to be the next one to be prosecuted. The role of the Dutch government is of particular interest. Having signed the United Nations’ Ruggie Principles addressing corporate responsibility to respect human rights and having vowed to do what is in their power to provide judicial remedy for victims and access to grievance mechanisms to deal with human rights infringements as a result of the activities of multinational companies, the Dutch government, together with the British, filed a brief to express the governments’ worries about an American law being used to prosecute a Dutch company. Members of Parliament have questioned Foreign Affairs multiple times, but the Minister maintains his interference does not clash with the Ruggie principles. With Friends of the Earth / Milieudefensie Nederland and the MVO Platform, I have filed a Freedom of Information request to find out who initiated this government interference, Shell, the British or….